Taking a break from all the Nordstrom Anniversary Sale madness to share a sweet summertime look that I’ve actually been wearing! I’ve been so wrapped up in all of the fall goodies that it’s a nice change of pace to share an outfit I wore to dinner earlier this week! When shopping this time of year, I always look for pieces that can be transitioned into cooler weather. I can imagine wearing this flirty top in the fall with distressed denim and booties. Another bonus with this top is it can be worn on or off the shoulder! This top has a lot to love about it, from the sleeves edged in ruffles to the the oversized ruffle at the top and all topped off with the cutest floral print. I wore this combo out for date night on Monday. I definitely thought to my self once or twice that this would be an outfit I repeat multiple times. Anybody else have an outfit that is their go to?? I am all about easy summer style, and love pairing pretty, flirty tops with cutoffs! As trends come and go, there is one trend I am excited to see sticking around…off the shoulder! While I love a good off the shoulder top year round, there is nothing better than baring a little shoulder in the summer time. It’s a great way to show off that sun-kissed skin without showing too much, and as popular as it has become, there are SO many options for great off the shoulder pieces! I always find my cutest off the shoulder pieces in the trend section at Nordstrom! I love that they have a wide variety of unique off the shoulder picks that don’t break the bank! They add new arrivals daily, so I have plenty of options and am always adding to my online cart! I recently picked up two new off the shoulder pieces that are perfect for summer! You might remember this romper from a few posts back. I was so in love with the fit, that I had to pick it up in this fun palm print, which screams summer (it comes in a midi dress and slip dress too!). Pack it for a beach vacay or wear it to run errands, it’s an easy, breezy piece for those hot summer days! This top rolls two fun trends into one…off the shoulder and poms! It’s great for pairing with jeans or shorts and is only $35, which is such a steal!! It also comes in the cutest black and white gingham print! Check out a few other off the shoulder pieces I am loving! Anybody else ready for the weekend?? It’s been so cold and rainy here, making it especially hard to adjust to reality after a tropical vacation! 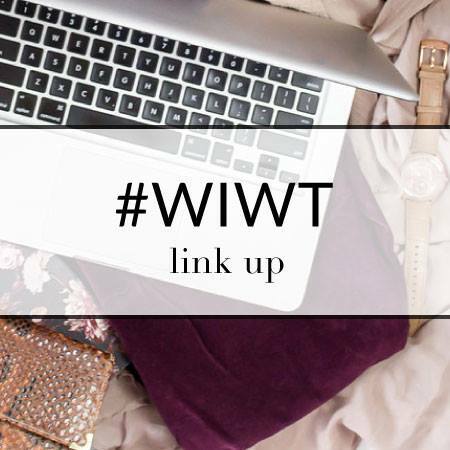 I’m currently cuddled up on the couch wearing flannel pjs and fuzzy socks under a blanket writing this post. I’m definitely missing sunshine, the ocean breeze and bare legs! 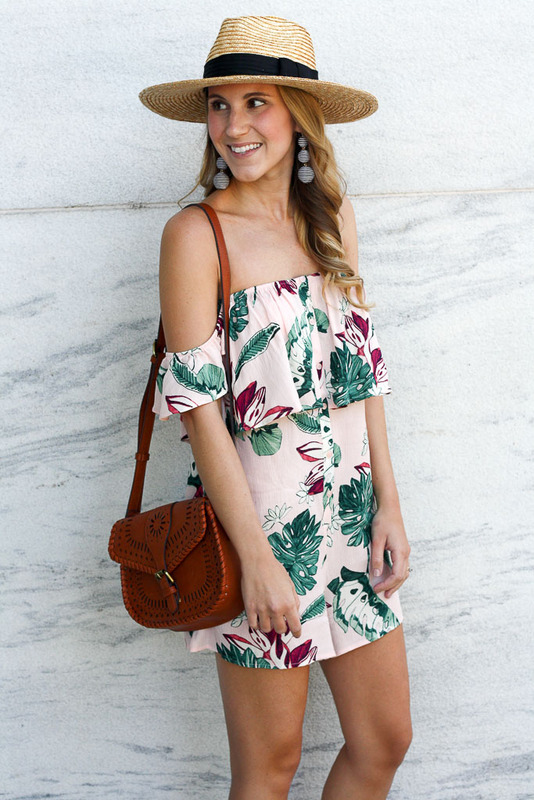 This palm print off the shoulder dress was perfect for Mexico! I have been palm print obsessed lately so this cutie was a must! The breezy fabric was perfect for the humidity and I love the fun bell sleeves! This will be a dress I wear time and time again the next few months! I can’t believe I haven’t gotten around to sharing this sweater. All winter long, this cutie has been one of my go to’s. It can be worn on or off the shoulder, making it the perfect day to evening top or spring transition piece. Now that the sun is making more frequent appearances and it’s warming up (supposedly), it’s the perfect lil weekend sweater. It’s lightweight, but made of the coziest fleece. I paired this with leggings for hanging around the house and was comfy all day. This is actually a look I have worn to work, only with the sweater on the shoulder. 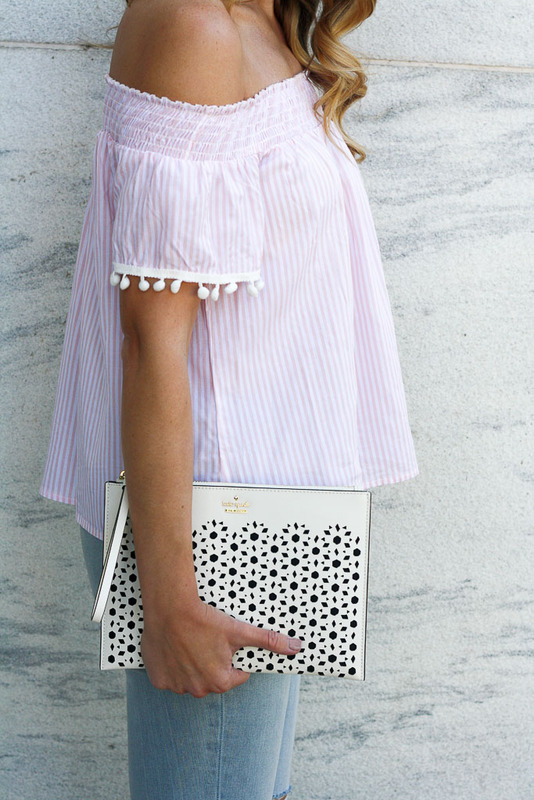 There has never been a more perfect top for wearing to work and date night!